header at inv.no — header will print starting at the beginning of the inv.no column (which is listed under the nam5 row). norepeat — we want to print the code one time for all the matching inventory items. skip — insert a blank line when the seg.code changes. header at “seg1” — will print nam1 starting at the column aliased as “seg1” (which id defined below the nam5 row). The inv.seg1 in the middle forces us to re-state the seg table for the code field, (code is in the seg table, not the inv table). shade — shade the cell containing nam1. Shade (bordershaded) is the same grey scale as the default column labels. 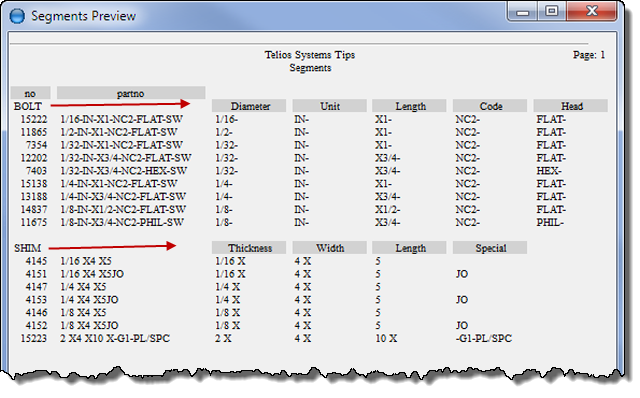 center — center the text of the segment name in the real estate of the “seg1” column. the inventory record number and part number which will print for each row. nolabel — we don’t want a column label to print since we are providing the variable column label from the segment template. as “seg1” — this sets the alias. The alias is equivalent to (nvinv.seg1). The BOLT segment template has 5 segments. The SHIM template has only 4,so the fifth column header label is blank. 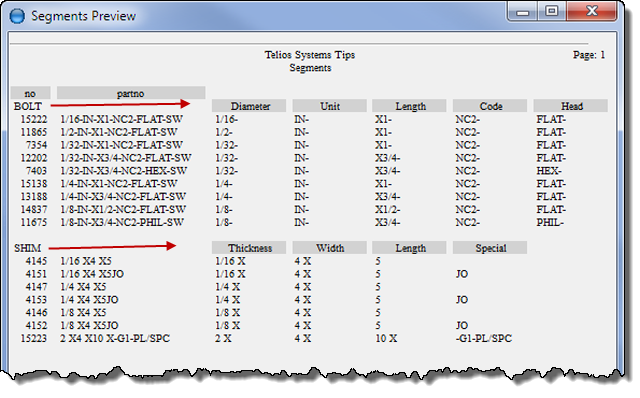 The normal column headings for the 5 segment columns are blank (nolabel).